After record-breaking rain at some locations on Friday, December 1, 2017, major floods are developing across northeast Victoria and southeast New South Wales, Australia. "At 13:00 Eastern Daylight Time on Saturday, December 2, we've got major flood warnings for the Ovens and King Rivers in Victoria, and the Seven and Castle Creeks as well," the Australian Bureau of Meteorology reports. "We've got a minor to a major flood warning for the Murrumbidgee River in New South Wales also." Minor to moderate flood warnings are in place for several other river systems across northeast Victoria and southeast New South Wales, and Severe Weather Warnings continue for heavy rain across the southeast, including the ACT and Canberra, where there's a risk of flash flooding later today. "Severe thunderstorms are also likely through parts of New South Wales today, so keep an eye on those warnings too." In Victoria, Melbourne remains covered by the Severe Weather Warning for the risk of some potential for some heavier rain later this evening. Flood Watches are extending all the way from parts of Queensland down through the southeast to Tasmania as well. The heavy rain intensified across the north of Victoria during Friday, with thunderstorms, and that extended across New South Wales and the ACT during the day. Many places across northeast Victoria recorded over 150 mm (5.90 inches) of rain in the 24 hours between 09:00 Friday and 09:00 Saturday. The rain's still falling, and by the time the rain ends, many places will have seen over 200 mm (7.98 inches) of rain. The highest recorded was 186 mm (7.32 inches) at Mt Wombat near Strathbogie. 149 mm (5.86 inches) at Lake Eildon broke its all-time daily rainfall record by almost half, and 123 mm (4.84 inches) at Echuca was the highest daily rainfall recorded there since records began in 1881. Melbourne saw heavier periods of rain during Friday morning, and then again overnight, but largely it sat on the fringes of the heaviest rain, thankfully, which was more to the northeast. 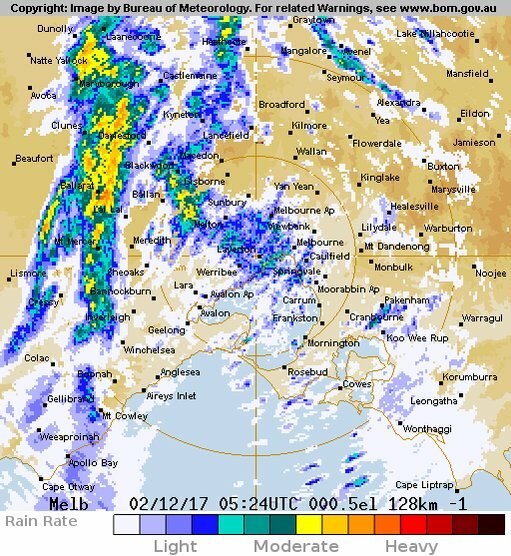 21 mm (0.82 inches) was recorded in the city, but suburbs across the north and east of the city saw more like 30 to 50 mm (1.18 - 1.96 inches), and Healesville, to Melbourne's east, saw 80 mm (3.14 inches) of rain in that 24 hours. During Saturday afternoon the heaviest rain will contract into the east of Victoria, and continue to push through central and southern New South Wales including Canberra and the ACT, where there's a risk of flash flooding later today. For Melbourne, the periods of rain will be intermittent during the day, and then this evening there is some potential for some heavier rain more like between around 18:00 local time and midnight, as a convergence line forms through the bay. We could see on the order of around 20 to 40 mm (0.78 - 1.57 inches) possible, just depending on where that line forms and how strongly it forms. On Sunday morning the heaviest rain contracts further east towards East Gippsland and by the afternoon the risk of heavier rain largely clears the southeast of the country. Areas of eastern and southeast Queensland will likely see some heavier rain during Sunday and Monday, and that's why there's a Flood Watch current, so keep an eye on that for impacts following recent heavy rain as well. "We're keeping our eye on the risk of an East Coast Low during the early part of next week of the New South Wales coast. The forecast today remains the same as yesterday, with the system and the heavier rain impacts likely to remain offshore. However, we'll continue monitoring over the coming days for the potential for the system just to move a little further west, in which case the impacts would be greater," BOM concludes.